Ski holidays to Sochi offer a unique experience, offering the opportunity to enjoy the incredible snow of the Caucasus Mountains and a brand new resort, currently mid-way through development for the 2014 Winter Olympics. Skiing in Russia is a one-off destination to stunning mountains and a very different culture. Sochi is a city on the coast of the Black Sea, where most of the visitors and athletes to the Winter Olympics will be staying, though you can stay here, the main ski areas of Rosa Khotar and Gazprom are currently an hour drive away — by 2014 this will be a 30 minute shuttle train. 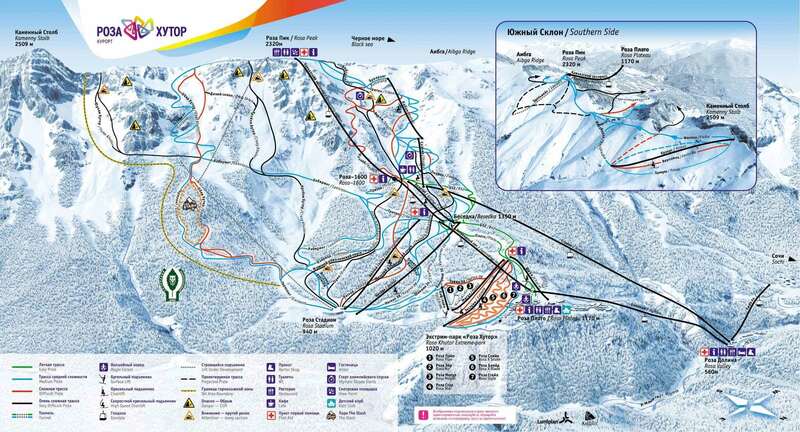 Most skiers will stay in the two resorts, which are around 5km apart from one another. Note: You will need to pre-arrange a visa before skiing in Russia. Sochi itself is not a resort, the two main resorts associated with Sochi, thanks to the 2014 Winter Olympics, are Rosa Khotar and Gazprom — named after Russian's state owned gas company. When completed the two resort will offer 150km of skiing across 58 state of art ski lifts. For the 2011/12 season 8 lifts were open in Rosa Khotar, with more expected to be running each winter up until the 2013/14 season. The resort of Rosa Khotar is filled with Alpine charm and you could easily mistake the scenery for that of a Tyrolean ski area. The village itself has something of an Austrian/Swiss feeling, but on a slightly larger scale — as in everything is one story or slightly larger then it should be. The Park inn Rosa Khutor is the only hotel currently on offer and is one of three that will make up the village by 2014. Gazprom is a slightly different style of resort, with a more modern feel to it thanks to the shopping, 3D cinema and other modern amenities, giving skiers to the option for a more lively resort. the Grand Hotel Polyana is the resorts top hotel, boasting 5*s and will no doubt appeal to the Russian fans of Courchevel and Klosters, as well as British skiers looking for a little luxury. The skiing in Sochi's resorts is varied and more terrain is set to be unveiled over the next two seasons. There is ample beginner skiing in Gazprom, though the instructors level of English isn't up to that of most French and Austrian resorts. For beginners a short flight to the Alps or Pyrenees may be more appropriate. For intermediate to advanced skiers there is plenty of terrain for a week or short break ski trip. Gazprom and Rosa Khotar both offer amble red and blue runs and around 1,700m of vertical drop, while Rosa Khotar also offers some more taxing advanced skiing. The huge snowfall records of the Caucasus Mountains — which is similar to that of Canada and the USA — means there is plenty of scope for some great off-piste skiing — though taking a guide is essential. Skiing in Russia and the resorts above the city of Sochi will be an amazing experience for years to come and as we approach and pass the Olympics, the facilities are only going to improve. To experience a different culture, a new mountain range and a once in a lifetime ski holiday, Sochi, Rosa Khotar and Gazprom offer an exciting opportunity.